RSW- Artwork page, "Farmer's Castle"
Originally the subject matter was a chalk drawing and a painting was made from that. RSW was never fully satisfied with the orginal painting made before the fire of 1934. Also see New England Castle to view related piece. 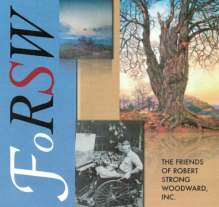 Checkout the Scrapbook to see various clippings, articles and other features relating to RSW! 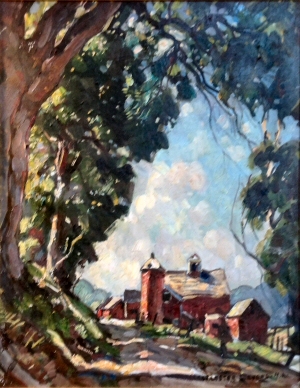 "Painted in 1940. Warfield's barn and silo (since torn down) out of Charlemont. Made a chalk of this just before my fire (1934) which immediately sold at Manchester. Before sending the chalk, made a painting from it, but it was never satisfactory to me. 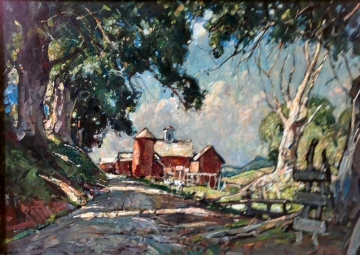 Loving the subject matter and the silo having been destroyed so I couldn't go back to paint I finally made, in the winter of 1940, this successful 27 x 30, then destroyed the earlier canvas from which I copied it." "....He can bestow grandeur and elegance upon a rustic structure like the red barn which he entitles Farmer's Castle." This painting now hangs in the Pocumtuck Valley Memorial Association (PVMA) Museum, Deerfield, MA. Thank you to everyone involved that saw to it we got these great pictures! Once located on the hill in Charlemont Center the barn, has since burned down. In an area rich with talented artist, it is not inconceivable to have certain subjects be painted by more than one of them. This is the case with the barns in Farmer's Castle. 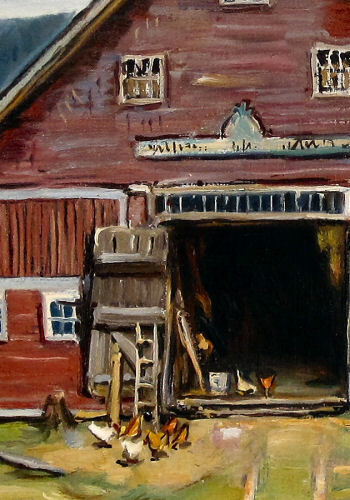 It was recently discovered that Woodward contemporary and nationally renown artist, Lester Stevens, living in nearby Conway, Massachusetts, also painted the beautiful barns and sheds found in Charlemont Center... Twice! 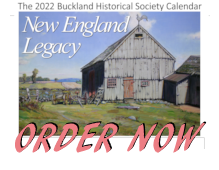 At a recent exhibition of Steven's work held at the Field Memorial Library (Conway, MA) in celebration of Conway's 250th anniversary, there hung two paintings by Stevens of the same barn. It is not known if RSW and Stevens knew each other personally. Stevens was an academic and traveled extensively. He taught at the Boston Museum of Fine Arts School but was 3 yrs younger than Woodward so it was unlikely he'd come across RSW there. 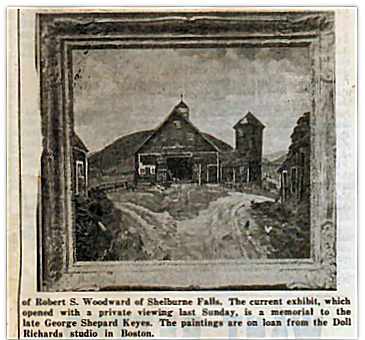 They often exhibited at the same shows and we thought that maybe they would have met at the Southern Vermont Artist exhibitions, however, we could not find a single example of Stevens ever exhibiting there. None the less, they had to have been aware of each other. Although Woodward is known for his paintings of traditional New England farms and homesteads, it is often overlooked how often he also captured the life of the times of the people doing ordinary and everyday activities. It is considered a form of social commentary popular in regionalist schools of art of the times. 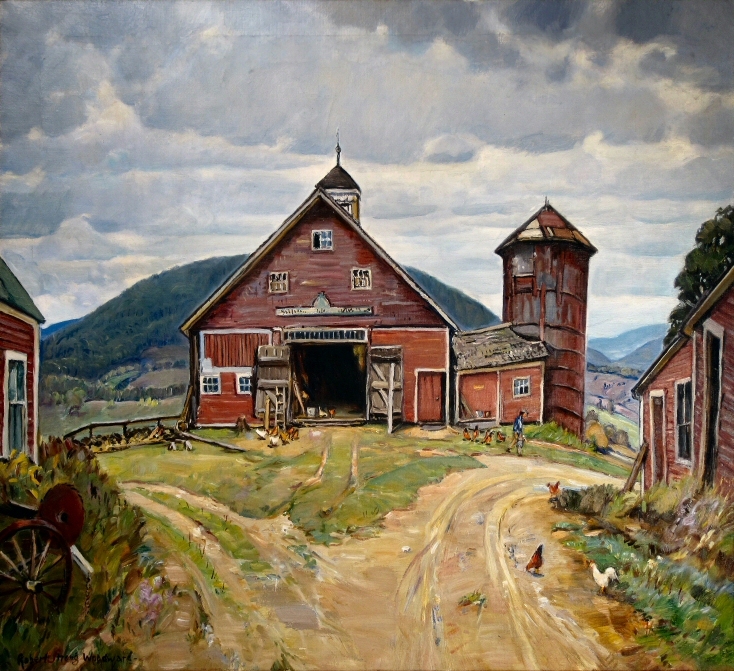 RSW was also unique in the placement of structures, like barns, being centered in a painting (unheard of for a landscapist) and yet he manages to pull it off with his acute draftsman skills. 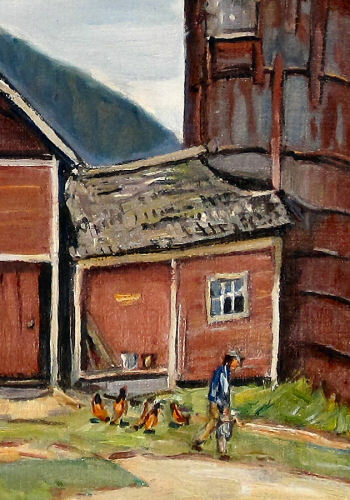 A closer look at the barn door and chickens. A closer look at the farmer.